Once again as per my recent post - Death & Departures: A Holiday Message, which discusses the themes of loss and grief in Collateral Beauty, Manchester By the Sea, A Monster Calls and Almost Christmas, the very next movie I viewed, Solace, just happened to fall into the same category of terminal illness and life altering grief. 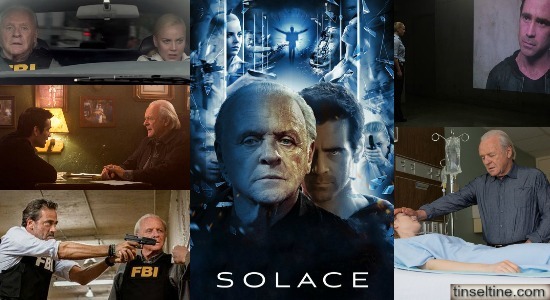 SOLACE starring Anthony Hopkins, Jeffrey Dean Morgan, Colin Farrell and Abbie Cornish, directed by Afonso Poyart, is a police investigation murder mystery originally planned and developed as a sequel to Se7en (1995), but was re-written to be its own stand alone thriller. Synopsis: When FBI Special Agent Joe Merriwether (Jeffrey Dean Morgan) finds himself stumped by a series of homicides, he decides to enlist the help of his former colleague Dr. John Clancy (Anthony Hopkins), retired physician and civilian analyst, whose ability to aide investigators in difficult cases with his “visions” made him an asset to his close friend Joe. Merriwether informs his ambitious, younger partner, FBI Special Agent Katherine Cowles (Abbie Cornish) that Clancy retired from his practice, quit working for the FBI and cut all contact with the world after the death of his daughter, Emma. Joe hopes he might be able to entice Clancy with this case. Despite Joe’s faith in his old friend, Katherine makes it abundantly clear that she doesn’t believe in psychics or clairvoyants and thinks they’re wasting their time. Clancy is the kind of psychic who sees things when he touches a person. Hence, on putting his hand on Agent Cowles’ shoulder, he gets a flash-frame of her with red blood streaming from her forehead. A portent that something bad is going to happen to her. Later we learn that Clancy doesn’t just see the future, he sees a multiplicity of futures, meaning different outcomes depending on small changes in circumstances. Hopkins, a producer on the film, is treading familiar ground here - he's genius-level brilliant, like Hannibal Lecter (Silence of the Lambs); has great stores of compassion like Doctor Frederick Treves (The Elephant Man); and is also world-weary and consumed by confused grief, like Henry Wilcox (Howards End). Not only these topics mentioned by Flynn, but I also noted themes similar to recent Superhero movies like Avengers: Age of Ultron and Batman vs Superman: Dawn of Justice regarding one's responsibility to society in using your special gifts. In Solace, both the protagonist and the villain possess psychic abilities which allow them to see the coming of suffering, but how does it alter a soul's journey when interfering and preventing that suffering? In Philly SOLACE opened December 16, 2016 and is playing at AMC Neshaminy 24 (3900 Rockhill Drive Feasterville-Trevose, PA 19053).